With global markets still reeling from last week’s stock market swoon that saw the Dow Jones lose 1,300 points and the S&P 500 dip 5 percent in two days, Bank of America’s monthly survey of fund managers is warning investors to take caution and heed the market’s warning signs. 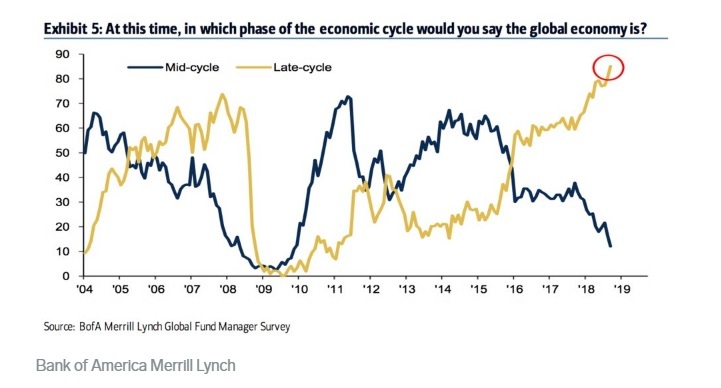 The Bank of America Merrill Lynch monthly fund-manager survey for October was conducted Oct. 5-11 — right in the midst of last week’s massive sell-off — showing global growth expectations dipping to their lowest levels since … November of 2008, two months after the housing bubble burst. 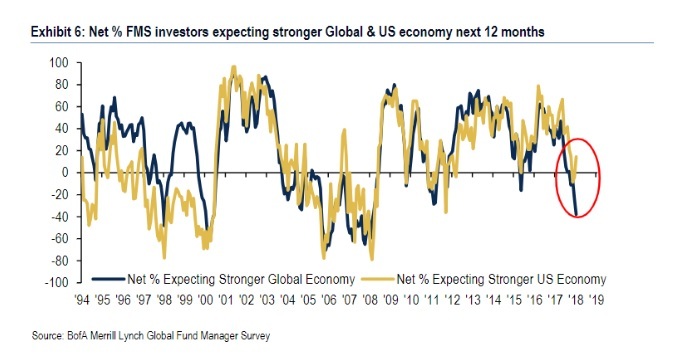 “Investors are bearish on global growth,” Chief Investment Strategist Michael Hartnett said. That percentage is higher than its previous peak of 74 percent in December of 2007. The net share of investors predicting growth will decelerate over the next year hit 38 percent, the most since November of 2008. Trade wars topped the list as the biggest risk to the global economy for the fifth straight month after the Trump administration slapped another $250 billion in tariffs on Chinese goods. The tariffs currently sit at 10 percent but will rise to 25 percent on Jan. 1 if a deal isn’t reached. However, another growing threat rose near the top of Bank of America survey respondents’ worries about the market: rising interest rates. Higher interest rates and how they impact borrowing, particularly from corporations, was named the biggest factor behind the S&P’s slide. About 31 percent of fund managers listed higher interest rates as the main driving force behind an impending market crash. Those surveyed said the S&P 500 will likely fall to 2,500 before the Fed will stop hiking rates, about another 9 percent drop. Another negative factor weighing on the S&P 500 is the upcoming midterm elections. If Democrats sweep both the House and Senate, 59 percent of respondents say that is a bad thing. FAANG stocks — Facebook, Amazon, Apple, Netflix and Google (owned by Alphabet) — and Chinese stocks like Baidu, Alibaba and Tencent are the most crowded trades for the ninth straight month. Respondents said energy and materials stocks are your best bet while they are divesting from growth and cyclical companies in October. Cash levels also are high at 5.1 percent. The stock market is having a tremendous day through afternoon trading on Tuesday, mostly due to quarterly earnings calls, but have a long way to go to undo the damage done last week.